Guys With Fancy Lady Hair: What men in updos, braids, and buns say about masculinity and femininity. “So many men spend years getting their manes all long and for what?” Bold Italic’s Jessica Saia writes. “To be occasionally bundled into a low ponytail? I’m not sure how ladies got to hoard all of hair’s styling potential when men can grow hair out of their faces.” So Saia gives eight long-haired men the prom-night updos society denied them: Mario DiSanto sports an elegant chignon, two well-defined ringlets fall deliberately from Mike Johnson’s top bun, Eric Seydor’s locks are braided around his head and threaded with sprigs of baby’s breath, some teasing at the crown adds a voluptuous kick to Bornen Orelatz’s Brigitte Bardot–inspired look. The conceit is simple, but the resulting glamour shots are provocative. It’s normalized for American women to spend hours at the salon molding their hair into spray-blasted bouquets. It’s even considered liberating and fashionable for them to chop it all off, as long as they pair their short cuts with suitably feminine touches so as not to appear too butch. 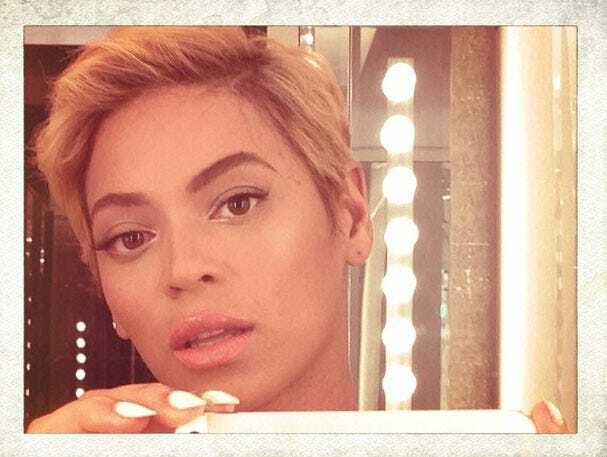 When Beyoncé debuted her new pixie cut—a feminine term for a traditionally masculine hair length—she paired it with cat-eye liner and painted nails; Janelle Monae rode her pompadours and fitted suits to a makeup modeling gig at Cover Girl; Charlize Theron, Amber Rose, and Natalie Portman have all rocked buzz cuts without threatening their most-beautiful-women status. In the case of “Guys With Fancy Lady Hair”—much like the high school football players who don wigs and skirts for the pep rally before the game­­—the stunt can actually serve to enhance the man’s masculine mystique. If he were to assume a feminine hairstyle on the regular, he’d be ostracized. But when he does it for a one-off photo shoot, he appears as a funny, easygoing guy for making himself the object of such a bizarre spectacle (for an hour or two). When his hair returns to its low-maintenance resting state, he emerges manlier than ever. For women, the show goes on.